The name Blorange, if you couldn’t figure it out, is a combination of blue and orange. 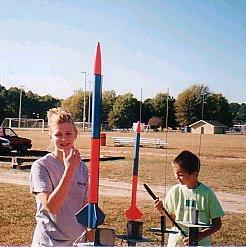 The original Blorange (smaller model), is actually the BT-50-based Redliner kit by Custom Rocket Company and was Jess’ third rocket kit. With a unique fluorescent orange and metallic blue paint job in lieu of the standard red-and-white scheme, a name change seemed appropriate. The larger model on the left is Blorange 2, a BT-60 upscale of the original and Jess’s first D-powered model. It also flies well on 24mm C11-3’s. One other change from the stock design for both sizes was the incorporation of canted fins for continuous spin during flight. A note on nose cone selection for Blorange 2: Estes PNC-60A would be a more “scale” choice, though Jess has used both the longer Der Red Max-style cone (PNC-60AH), as well as the Custom Rocket Company PC-60, both of which look great. Due to crimping above the fins over several flights, both models have been rebuilt at least once. As of 2014, Blorange 1A is still going strong, but Blorange 2B was lost at ECRM-38 in 2011 the same day as the Iris. It is currently waiting to be rebuilt.